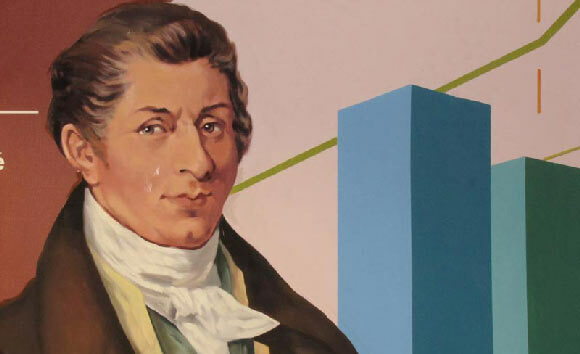 Jean-Baptiste Say was a French businessman and economist best known for introducing Say’s Law. He was a strong proponent of free trade and competition who, throughout his life argued against the restraints on free business activity. Say worked at an insurance company and was also the editor of a popular periodical of the time. Say was born in Lyon, France on 5 January 1767 to a middle class family of Huguenot textile merchants. He spent the majority of his early years moving around Europe, living predominantly in Geneva and London. Say completed his education at a private school in Croydon (a township in South London) after which he was employed by a merchant in London. After said merchant died, Say returned to France and started working a life insurance company under the directorship of Etienne Clavière. When the French Revolution started, Say was working as a secretary to Clavière, who was then Finance Minister. Say soon established his reputation as a publicist and in 1794, started editing at periodical called “La Decade philosophique, litteraire, et politique” where he analyzed and elaborated the teachings of Adam Smith, the father of economics. When the consular government was established in 1799, he was selected as one of the hundred members of the Tribunate, resigning his editorship of “La Decade”. Soon after, Say was removed from the Tribunate because he was unwilling to forgo his own beliefs for those of the Napoleon administration. After the Napoleonic Wars, he held a Chair of Political Economy at the Conservatoire des Arts et Metiers, and again, later, at the College de France. Say later founded, and worked at a cotton spinning mill that employed around five hundred people. His devotion to laissez-faire principles appears to have been maintained throughout his life. During his life Say was also sent to England by the French government to study their economic condition; his findings were later published. Jean-Baptiste Say strongly supported the free reign of market forces and was against intervention. He has a great legacy towards the field of business and economics though he is rarely mentioned. Say was a foreign member of the Royal Swedish Academy of Sciences and he co-founded ESCP Europe which became the first business school in the world. He is best known for Say’s Law which states that “supply creates its own demand”. It is controversial as to where exactly this idea originated from but it is attributed to Say. Say’s Law has various interpretations: The long-run version is that in general there cannot be overproduction of goods for a very long time because those who produce the goods, by their act of producing, produce the purchasing power to buy other goods. Say is the best known expounder of Adam Smith’s views across Europe and America, though he did not agree with all of Smith’s teachings. With regard to the theory of value, Say was one of the first economists to realize that the value of a good was measured by utility and not cost of labor. During his later years, Say became ailed with Apoplexy and his condition greatly worsened when his wife died. He was buried at the Cemetery of Invalides in 1832.